If you're planning to pack up the family and head out to the National Mall for the concert and fireworks on Sunday, being in the know about restrictions and closures will make everything smooth-going. The 30th Capitol Fourth Concert kicks off at 8 p.m. on the West Lawn of the U.S. Capitol. Sunday's host will be none other than Emmy and Golden Globe Award-winning actor Jimmy Smits. Musical guests include Reba McEntire, Gladys Knight, Darius Rucker and David Archuleta. The National Sympony Orchestra and the Choral Arts Society of Washington will perform. The concert finale includes Tchaikovsky's “1812 Overture” -- featuring the U.S. Army Herald Trumpets -- and will end with live cannon fire provided by the U.S. Army Presidential Salute Battery. Also featured are the U.S. Army Ceremonial Band, the U.S. Marine Drum and Bugle Corps, the Joint Armed Forces Color Guard, and the State and Territorial Flags of the Military District of Washington. But transportation officials are trying to ease the congestion. If you're coming from Virginia, lane restrictions on major roads and highways will be lifted from noon on Friday until noon on Tuesday. Officials are urging people to take public transportaion because street parking will be extremely limited. 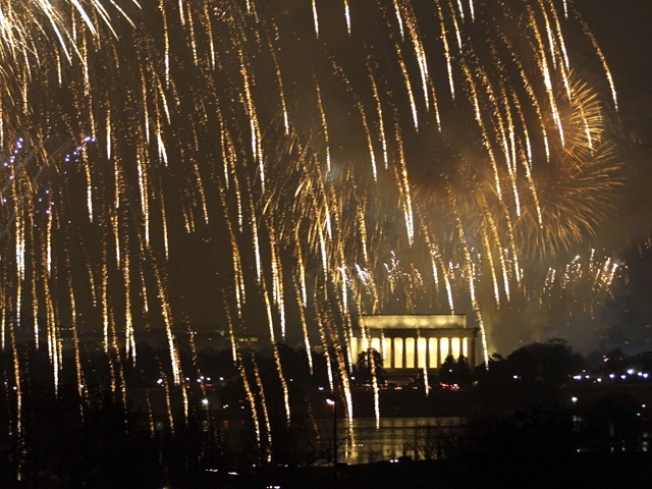 Metro riders should expect rush hour crowds between 6 p.m. and midnight on the Fourth. But there will be extra service on Sunday. The nearest Metro stops to the concert are the Capitol South station and Union Station. Police will be directing tour buses to their designated pick-up and drop-off sites near Third Street between Constitution Avenue NW and Independence Avenue SW.
Gates for Sunday's concert open at 3 p.m. The northside gates are on First Street and Constitution Avenue NW and on Third Street and Pennsylvania Avenue NW. Southside gates are at First Street and Independence Avenue SW and Third Street and Maryland Avenue SW. All gates are wheelchair accessible. Service animals are permitted and pets must be kept on a leash that is no more than four feet long. There will be extra security measures in place, including a search of all bags, coolers, backpacks and closed containers. The United States Capitol Police wants to remind everyone that DC law prohibits any open containers with alcohol inside. For this event, all adult beverages of any kind are prohibited. But you can bring food. Also allowed are strollers and folding chairs. Other no-no's include grills, bicycles, umbrellas, sticks, poles, mace, fireworks, non-aerosol sprays, tools, posters or signs. Also, please don't bring electric stun guns, martial arts weapons or devices, knives, blades, sharp objects, razors and box cutters, and laser pointers. Security screeners will use their descrition to confiscate anything they believe may pose a threat. If you can't make it out on Sunday, the full concert dress reheasal will be held Saturday from 8 p.m. to 10:30 p.m. Gates open at 3 p.m. It's supposed to be in the mid-90s, so bring lots of water. The 30th Capitol Fourth Concert will be broadcast live on PBS.